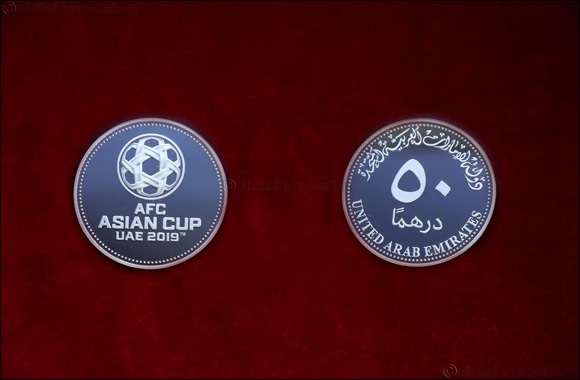 Dubai, UAE, January 08, 2019: Central Bank of the UAE announced that it will be issuing a commemorative silver coin and a commemorative one Dirham coin, on the occasion of hosting the Asian Cup - UAE 2019, with effect from Wednesday 09/01/2019. 1. Diameter : 40 mm. 2. Weight : 40 gms. 3. Alloy : 92.5% Silver. 4. Issue Size : 1,000 Coin. The obverse face of the Coin depicts the logo of this occasion. The back depicts the denominational value “٥٠ ������” inscribed by the State, United Arab Emirates, written in Arabic and English.